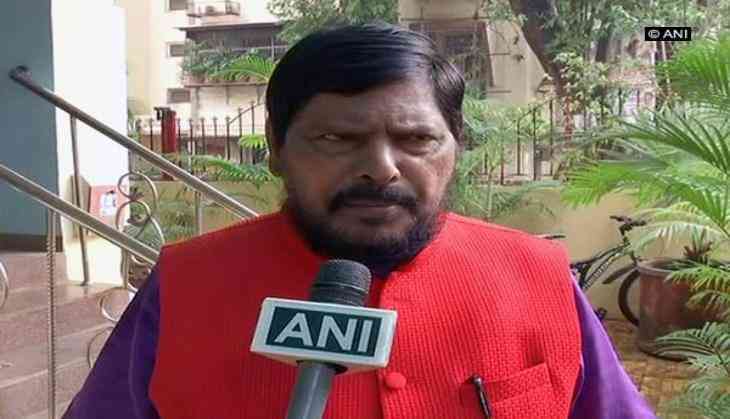 Union Minister Ramdas Athawale on Friday said if the five people, arrested by the Pune police in connection with the Bhima-Koregaon violence are followers of Ambedkar, then they should not be considered as Naxalites. He also said that he would try to help those arrested, if it is not found that they have any connection with the Naxal movement. "There is no connection between Yalgar Parishad and Bhima Koregaon violence. Five people who were arrested yesterday, if they are followers of Ambedkar they should not be considered naxalites. There should be a thorough investigation in the matter," Athawale told ANI. "I will talk to the Chief Minister (Devendra Fadnavis) regarding this. If those who were arrested yesterday have no connection with naxal movement then I will definitely try to help them. I want to appeal to the young followers of Ambedkar that they should not have any association with naxal movement," he added. The five people arrested by the Pune police in connection with the Bhima-Koregaon violence have links with Naxals, the city's Joint Commissioner of Police said on Thursday. Among those arrested include Surendra Gadling, Sudhir Dhawale, Rona Jacob Wilson, Shoma Sen and Mahesh Raut. A Pune Court on Thursday sent all the five arrested, including activist Rona Wilson and lawyer Surendra Gadling, to police custody till June 14 in connection to the Bhima Koregaon violence case. A Delhi Court has sent Jacob to two-day transit remand. He will be produced before the local court in Pune on June 8. Gadling too was arrested in connection with the same incident. On January 2, the 200th anniversary of Bhima-Koregaon battle took a violent turn when a youth died in clashes on during an event to mark the day. The violence left one dead and several injured, including 10 policemen.